“I just have 14 days to save my baby’s life. The day we finally took him home was supposed to be the happiest day of our lives, instead, it was the most terrified we’ve ever been. We had no choice but to stop his treatment because I’m struggling to even buy his medicines now. Our baby cries so much, and suddenly stops and struggles to breathe. Every time this happens, we think it’s the last time.” - Mahesh, the baby boy's father. After hours of pacifying their sick baby, Mahesh and Suma finally find a quiet moment for themselves. But even in those few moments of silence, all they worry about is whether this will be their last night as parents. Their baby boy’s severe heart condition is only getting worse with time. The only thing that can save him is an urgent heart surgery in the next 2 weeks. Without which, their baby won’t make it. 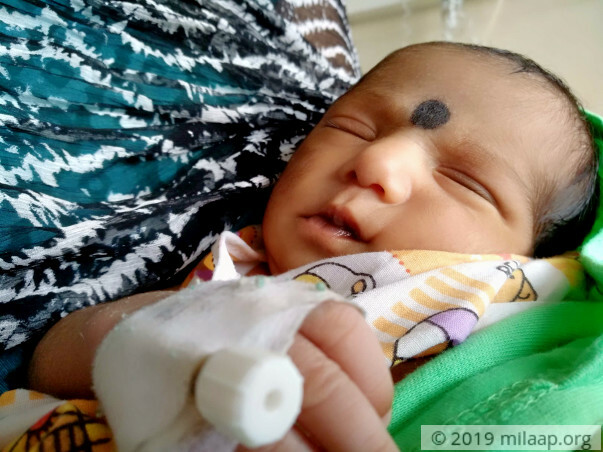 On 17th June, Mahesh and Suma welcomed a beautiful baby boy, but instead of hearing his cries, they heard his quiet gasps for breath. He was immediately placed on oxygen support, but within hours, Mahesh was told that their son was fighting more than they had imagined. 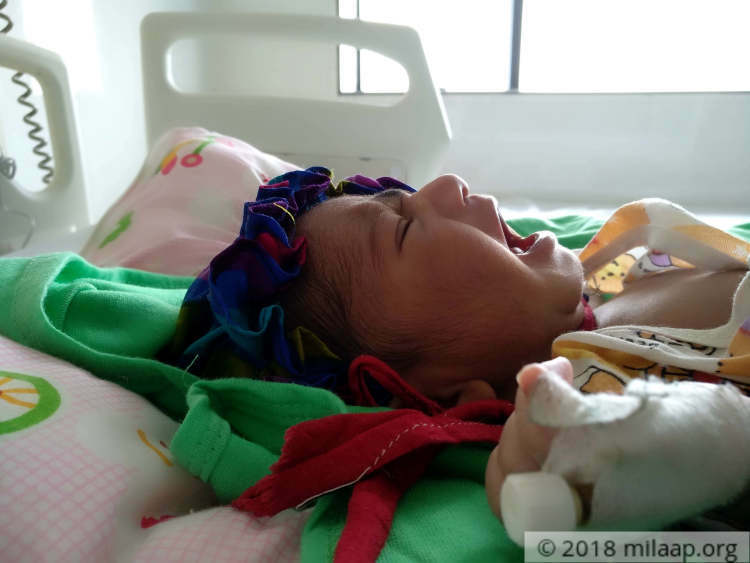 Mahesh and Suma’s 16-day-old baby not only has a hole in his heart, but also a congenital heart disease, due to which his heart can’t pump blood properly to the rest of his body. He needs a heart surgery at the earliest to survive this disease. His parents are desperate, but they can’t afford his life-saving treatment. Mahesh was newly appointed as a teacher in a college in his small town in Nalgonda district, Telangana. 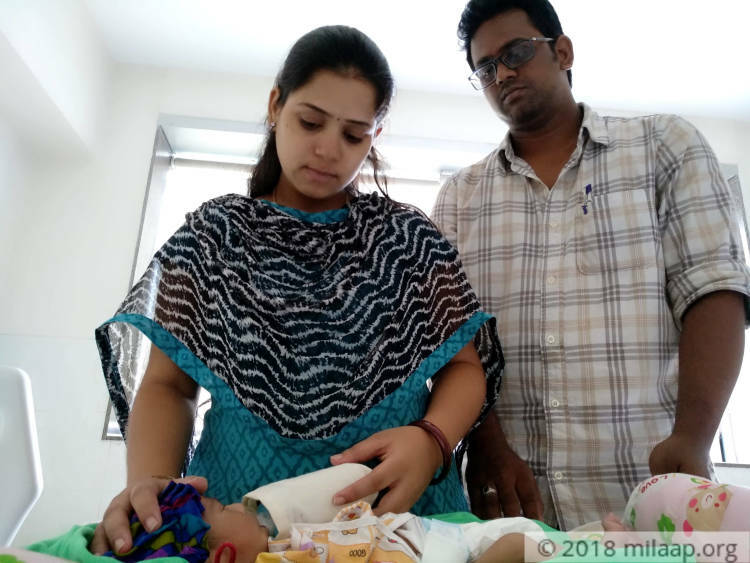 With a new job and the birth of his baby, he and Suma finally thought that their life was on the right track. Unfortunately, all their dreams came crashing down. 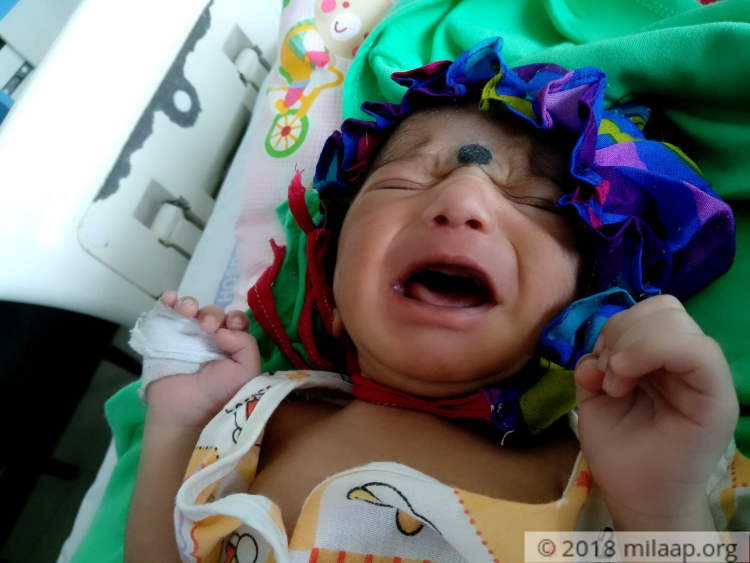 Mahesh now needs 5 lakhs to save his baby, but after spending all his savings on his treatment so far, he has nothing left. He had no option but to take his baby back home. 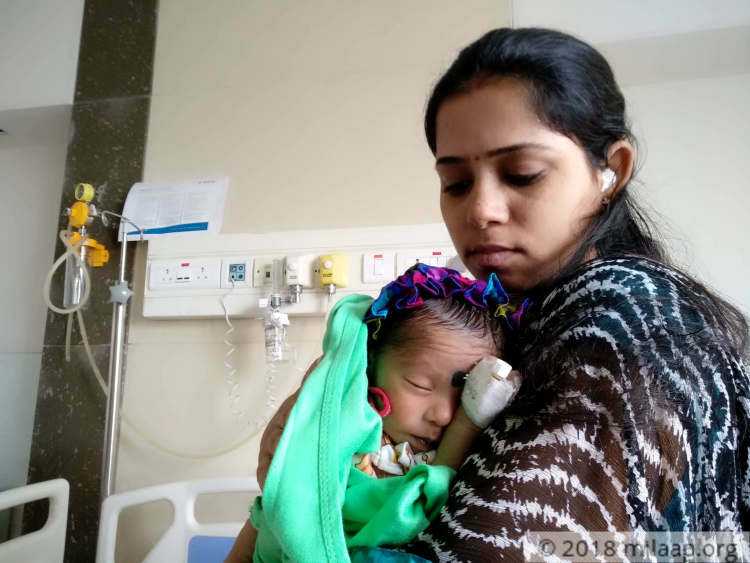 With little left to call their own, all Mahesh and Suma can now do is wait for a miracle. 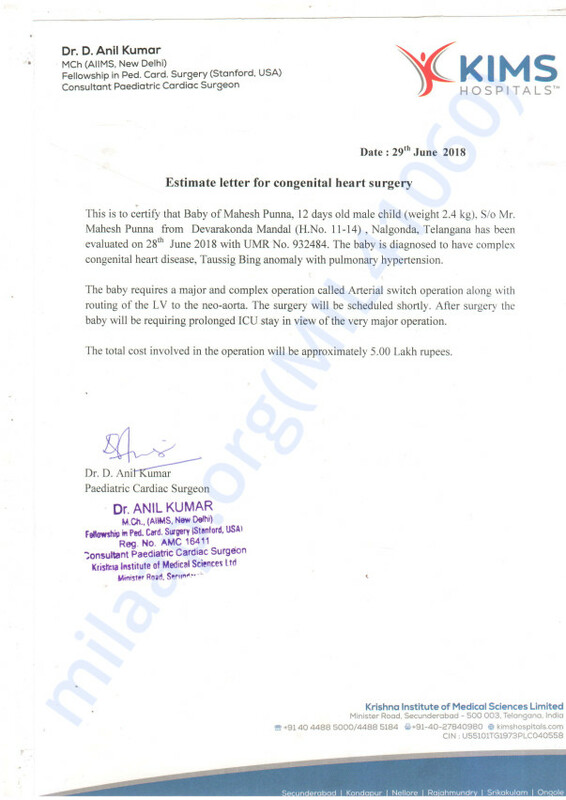 Mahesh and Suma’s baby boy needs a heart surgery in the next two weeks to survive. Each day without the surgery is only pushing him closer to his parents’ worst nightmare – death. Only a few days in this world and the baby boy is already enduring a world of pain. He needs your support to survive with heart terrible heart disease. Thank you for the wonderful support that you have shown towards Mahesh's baby. 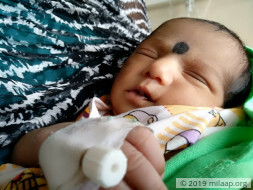 I am very sorry to tell you that Baby of Mahesh Punna who had surgery for Taussig Bing anomaly underwent arterial switch and complete repair two weeks ago passed away today. 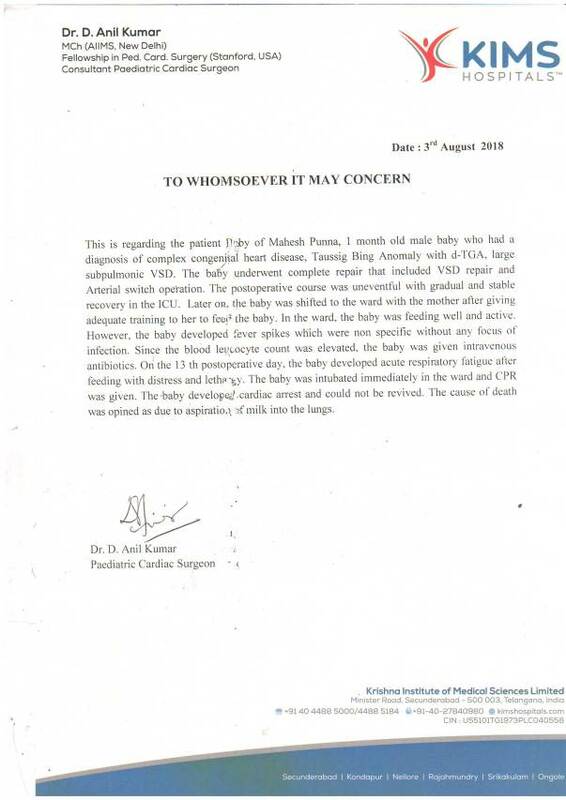 The baby was recovering well after the procedure. His mother, Suma was feeding him and he developed an aspiration in the lung. In spite of our best efforts, we could not save him. due to your amazing support, we were able to provide the best treatment and care. The funds raised so far will be utilised towards his treatment till date. Yesterday the baby has undergone the surgery. The baby is now on ventilator support recovering. We will keep you further posted once we hear more from the Doctors.